This week Focus LDN talks with Turkish artist Loosh in the build up to our CONTEMPORARIES exhibition in June. Through painting we express a vision or an idea, we transform our perception into a visual reality where others can also perceive the image. When did you realise you wanted to be an artist? Probably when I was really young, at like six or seven. How did you know at that point? My grandpa put an easel, canvas and paints out and we had a big fat painting party. I was so mesmerised and it was so fun that I kept my developing my interest in it through school and into my adult life. I actually mix a lot - I use acrylics at the moment with various acrylic mediums: markers, varnishes and spray paint - it is still painting, but mixed media painting. I work mostly on canvas, but also reclaimed wood because I like to use pieces of the city. What are you trying to convey in your paintings? In the animal paintings I am trying to capture moments of them in their natural environment. I am interested by their healing properties and how we can learn from them. If a certain animal appears in front of me at a moment of reflection I think, “oh what is that doing there” for example, if I saw a spider in an unexpected place, I would look at it and its natural behaviour; it makes webs and is an amazing architect, so maybe this is telling me that I need to start building. So you find guidance in their behaviours? For example, at a moment when you have to overcome an obstacle, you observe a creature’s behaviour and upon contemplation you find a solution. And what about the mushrooms that you are so famous for painting? I am always glorifying the properties and benefits of mushrooms in connection with our use for them or the part they play on our gorgeous planet. Mycelium, the fruit of mushrooms, is actually pretty amazing, it naturally is there to breakdown and recycle nitrogen, carbon, plant and animal debris; it basically turn the forest soil into a rich one, but not only does it do this, it also takes care of our toxic waste. Oyster mushrooms have a networks in the earth which connect most plants together, this network allows mushrooms to communicate and grow towards where they can help nature to heal. They clean waterbeds, soil and even radioactive contaminated areas. They act as filters and leave the earth clean where it was toxic. This takes time, Now, more than ever, we need to let them do their job to help with the amount of toxicity in our nature. So they are healing, and work together in a network, like each one of us working to survive together in busy city environments, communicating for the better, for change. What made you interested in these botanical and natural themes? From the moment I was born I have always loved nature. Living in London, it is nice to explore areas of nature. It is quite incorporated into the city and I think it if we left it to grow it would take over. You are from Istanbul, Turkey, do you ever exhibit out there? 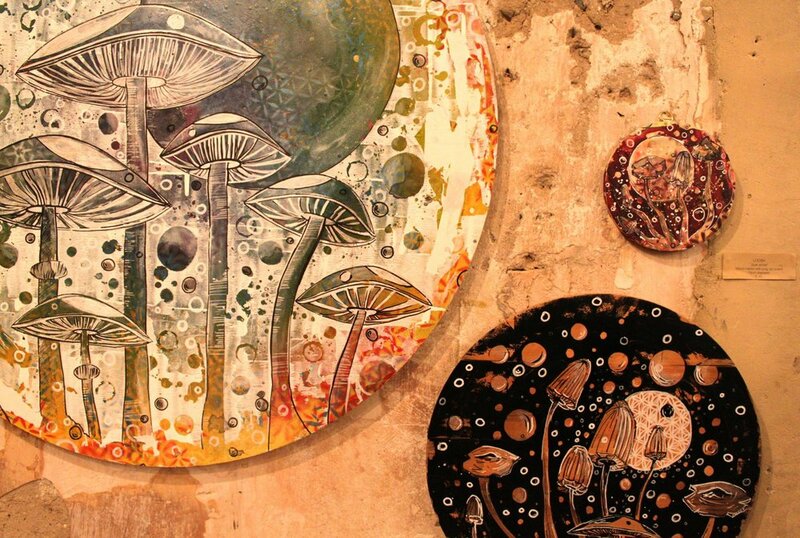 Yes, I just came back from an exhibition there, it was called Psychedelic Art, and I exhibited two oval shaped mushroom paintings and a wolf; one of my spirit animals. I also painted cows, because I was really inspired by seeing a lot of cows in the fields of Turkey. They are actually very beautiful and I wanted to show them in their glory, as opposed to just a meat that humans consume. Do you think there is a big difference between the Turkish art scene and British? I don’t know, it depends which art scene we are talking about, in terms of these psychedelic events there are not so many in Turkey, so it was quite a unique original show that I was asked to be a part of. What are your aspirations for the next couple of years? I see myself interacting more with other artists, collaborating, doing larger scale as well. Also, I’d like to teach art workshops for children, but yeah in general I want to keep my work developing and to continue expressing. You used to organise exhibitions, tell us more about that. I used to, right now I don’t do them so often because I am more into creating at the moment. I did quite a few of them with a lot of people and it was a lot of work! After a while it was good to take a break and be a part of other people’s exhibitions. I am enjoying that part of my life, but it was nice, especially getting to know how artists go about their existence and how their minds work. The other day someone asked me, “Isn’t it so competitive being an artist in London?” and I told them that I don’t know, it isn’t my business if it is or isn’t. I just enjoy being part of something, exhibiting together and sharing that energy. I love to share the aesthetic beauty of medicinal plants and animals with people through my art. So a lot of people will come to the show and leave wiser than when they came. I think that every time they do! Loosh's painting will be exhibited in CONTEMPORARIES this June 21st - 25th at the Old Brompton gallery.